Flight deals are omnipresent. It's great to find a cheap trip to Iceland or Hawaii or, uh, Sioux Falls, but it's always about where you're going and not how you get there. When you travel by train, the trip can be just as enjoyable as the destination. That sounds like the cheese-laden slogan in a train commercial, but it's not. Some train rides are long and dull. Some -- like going from New York City to Montreal as the leaves change -- can be incredible. One of those beautiful treks is on sale now. Amtrak's Pacific Surfliner is running a sale where you buy one ticket and get the second for half price. 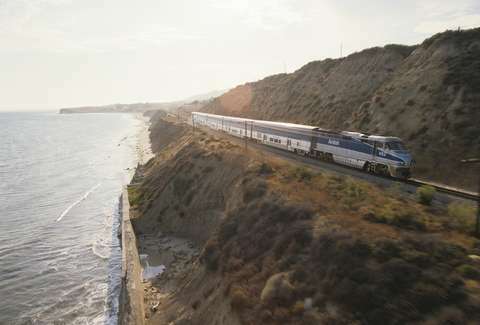 The Surfliner runs down California's Pacific coast from San Luis Obispo to San Diego with stops in Los Angeles, Santa Barbara, Anaheim, Ventura, and other places you wouldn't mind spending a weekend. The round-trip tickets can be found on the cheap. An example itinerary for two from San Luis Obispo to Ventura costs just $115.20 for the round-trip tickets. The deal is available on midweek travel -- Monday to Thursday -- through May 23. The tickets must be purchased on the same reservation using the code "V402" to get the discount. Each traveler may check up to two bags and bring two personal bags on board the train. "We are excited to offer this promotion as part of our Hug the Coast campaign, which celebrates everything that makes Southern California great," Al Murray, chairman of the Los Angeles – San Diego – San Luis Obispo Rail Corridor Agency, said in a statement. "We hope this encourages midweek getaways and scenic train trips along the coast to our region’s beautiful beaches, natural preserves, and vibrant downtowns." Take advantage of the deal and you'll be cruising happily along the California coast like Nick Charles heading west at the end of The Thin Man.